Make the pecan topping by mixing the ingredients together until crumbly. Make the sauce by heating the oil. Add the garlic and fresh herbs and saute for a few seconds, then add the flour and continue to cook until the flour is well mixed into the oil and forms small crumbs. Add a cup of the nondairy milk, using a whisk to mix so lumps don't form. Add the remaining milk and whisk it in as well. Add the nutmeg, salt, and ground black pepper to taste and bring to a boil. The sauce should thicken. Turn off the heat and add the orange juice. Spray a casserole or baking dish with cooking spray. Shingle in half the sweet potato slices in a decorative pattern -- I like making concentric circles. Pour half the creamy sauce over the sweet potatoes, using a ladle. Shingle on the remaining sweet potato slices and pour the remaining sauce evenly over them. Cover with aluminum foil, place on a baking sheet, and bake for 35 minutes. 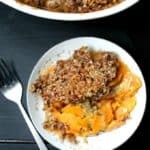 Remove the foil, scatter the pecan topping over the sweet potatoes, and continue baking, uncovered, for another 25 minutes. Let the scalloped potatoes stand on a rack at least 30 minutes before serving.